A wire harness can be a very useful part of many different projects. You want to make sure that you can properly use the materials that you have. You also want to make sure that you have the correct materials for the project at hand. This list of top five mistakes can help you with the basics of working with wire harnesses. One of the most common mistakes is not being aware of a project that can use a wire harness. At times a project can be assembled easier using a wire harness over other wiring options. Due to being unaware of the possibilities you won’t be able to use a more convenient and possibly better functioning product for your project. Therefore, your project may suffer in functionality. The old saying about measuring twice while working on construction projects can apply just as well to wire harness usage. It is always better to measure the length you need of wire more than once. Consequently, if your measurements are not correct you may end up with a wire harness that is much too short for what you need. If your connections cannot reach their destination that wire harness will become useless to your project. 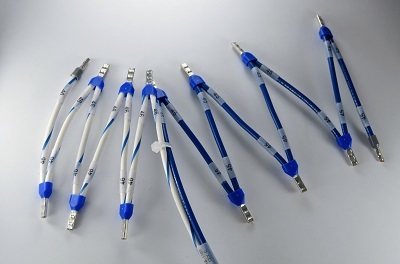 You want to be sure of the connectors that you need for your project. 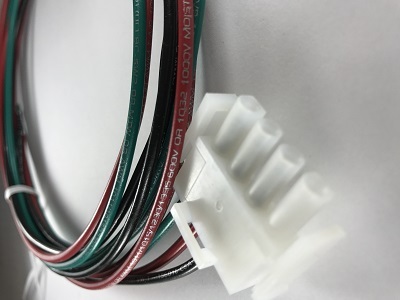 If your project requires a female connector and the wire harness that you have has a male connector it will not do you any good. Knowing the different types of connections when working a project is very important. 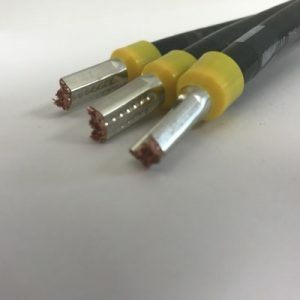 It is important to know what products you are working with, due to the many different types of connectors and wires that can be used in projects. Along with using incorrect connectors a major mistake when working with wire harnesses is using the wrong harness all together. You need to be aware of what type of harness you need for your project. 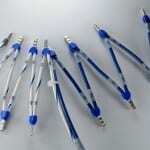 While some projects require larger gauged wires, others will require smaller gauged wires. You want to be sure of what types of wire harness that your project needs in order to function properly. A lot of people think that if you cover a gash in a wire with electrical tape that wire is good to go forever. While electrical tape is a great thing to have in a pinch, it is not a permanent solution. Broken, cut, or cracked wires within harnesses should be replaced or not used. Unfortunately, replacement is the only surefire way to ensure that a wire’s integrity is intact and that it will hold up to its tasks. To learn more about wire harnesses you can look at our Wire Assembly page. Ground Straps: What Are They And What Are They Used For? You can also check out our Wire Harness Custom Estimator. In addition, click here for an Instant Quote on Braided Ground Straps. Finally, let’s get social. Please connect with us on Facebook, Twitter, Google+, and LinkedIn. Have you been looking into a wiring project? Do you know what gauge of wire is best suited for your needs? Our tips can help you in the choosing process of wires! 1: What type of project are you doing? 2: How much space do you need for wiring? To begin with different housings for different projects will vary in size. Due to the wire size, the space needed to house them will vary. If you think about a light switch, some have a single switch and therefore only need enough room for the wires of that one switch. However, there are light switches that have multiple switches. Therefore, the space required for the wiring of a multi-switch receptacle is larger than that of a single switch receptacle. In order to do a job properly, you need to be aware of how much space you have to work with and really need. If you are working on home wiring that requires a larger current as opposed to a robot that requires less current the space needed is different because the wire size will be different. 3: How are wire gauges calculated? Especially relevant is the fact that as wire increases in physical width, the gauge of that wire will decrease in numerical value. While this does seem backward it’s really not. Due to the wire drawing process, the number of operations that it takes to get it to that physical size is the numerical gauge of a wire. As a result, gauges are larger or smaller than the physical size. 4: What are large and small gauged wires used for? There are also many different gauges of wire. Consequently, they have many different uses. 5: How much amperage do you require? In addition to these tips you can learn more about wire gauges by looking back to our previous blog Why Do Wire Gauge Sizes Seem To Work Backwards? In conclusion, the chart below will be helpful in deciding which wire is appropriate for your specific job. 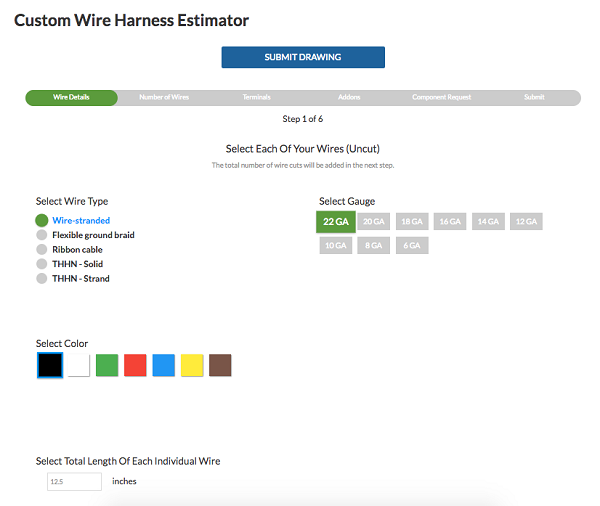 If you are interested in designing your own wire harnesses check out our new Wire Harness Estimator to get a quote! 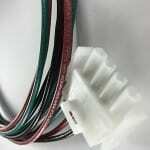 For additional information before you get started check out our blog on The Wire Harness Estimator Components Defined. You can also learn more about our pre-designed wire harnesses by checking out our Wire Harness Page! Also, check out ElectricalSchool.org for a glossary of electrical terms. Lastly, let’s get social. Please connect on Facebook, Twitter, Google+, and LinkedIn. Never bet against a company dedicated to creating a Positive Work Environment. A deep commitment to innovation combined with maintaining a healthy entrepreneurial spirit are driving forces that can enable a small business to achieve great heights. 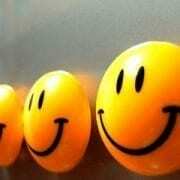 Having fun while at work makes an enthusiastic workplace and a dynamic team. 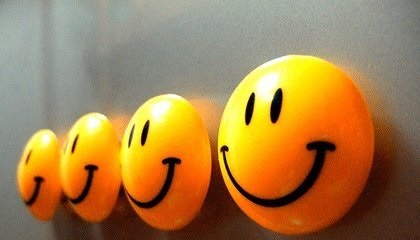 According to the Harvard Business Review, a Positive Work Environment is more productive. In the article, “Proof That Positive Work Cultures Are More Productive“, the authors share that work stress significantly reduces the health and productivity of employees. Absenteeism, disengagement, and lack of loyalty all dramatically increase costs and hurt the bottom line. Deliberate actions allow a company to create a dynamic culture, which includes ambition, competitiveness, creativity, flexibility, enthusiasm, and initiative. Combining these efforts with the ability to take risks and bear responsibility is a winning formula. Many large companies founded by visionary leaders begin as a start-up enterprise and eventually evolve into an industry powerhouse. Ever fly on Southwest Airlines and have a stewardess serenade the audience while giving out the flight instructions? Southwest Airlines has produced 40 straight years of profits in an industry that continuously suffers massive financial losses and has been littered with bankruptcies over the years. Southwest lives by a daily mantra to never accept status quo tracing back to its founder, Herb Kelleher. He pointed out that it is extremely difficult for a competitor to imitate a company’s success. According to an article in Forbes, Kelleher states,“They can buy all the physical things. The things you can’t buy are dedication, devotion, loyalty—the feeling that you are participating in a crusade”. Taking a tour of Falconer Electronics displays hard working Americans dedicated to producing high-quality commercial outlet strips, printed circuit boards, and wire harnesses. You will hear machines running, trucks rumbling, computers cranking and other sounds of great products being produced. More importantly, you will hear lots of laughter. Our team has a wicked sense of humor. You can always hear someone laughing over something hysterical. Either a goofy event that occurred over the weekend with a friend or family member. A crazy pet story brings a good laugh as well around here. Work hard and laughing harder is our mantra! Our office is located near Wegmans Food Markets which provides an excellent role model for small businesses. Fortune ranked Wegmans as the #2 Best Companies to Work For in 2017. This year marks the 20th straight year landing on the Fortune 100 Best Companies to Work For list. Wegmans institutes a thriving Positive Work Environment that combines fun with professionalism to deliver outstanding customer service. This winning formula proves hugely successful and profitable with Wegmans celebrating 100 years in business. Thank you for reading our post on a Positive Work Environment. Please connect on Facebook, Twitter, Google+, LinkedIn, and Pinterest for more electronic info. Outsourcing manufacturing operations can deliver tremendous benefits to your business. Unfortunately, there are many risks attached as well. Today we continue discussions by addressing Discreet Questions to Determine Character Compatibility and Financial Viability. Asking tough questions will help narrow down your selection process. This post is Part 5 of our series on Outsourcing Custom Manufacturing Operations. 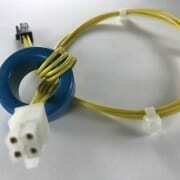 In particular, Outsourcing Wire Harness Manufacturing Processes. So you have entered the interview process to select a new custom manufacturer to partner with. Now you are digging deeper in the due diligence process to see who is exactly the best fit. Financial stability is certainly one of your absolute top concerns. If you are both small businesses, discovering actual financial figures or intimate information may be difficult to obtain. Even though this is crucial, especially if the project or product represents a significant portion of your sales. So what steps or strategies can you take to discover the financial viability of this new prospect? Below are a number of discreet questions that you could ask that would potentially reveal any red flags for you. This blog is being written from a poor previous experience with outsourcing services to a fulfillment center. There were many warning signs. Actually, what is above warning signs? Shots fired across the bow? We would pay the company tens of thousands of dollars each month which was paid on our credit card. On two separate occasions, the company ran our credit card twice, on the same day. The first time seemed like a simple mistake. “Oops, our credit card processor must have processed the card twice. So sorry. We will issue a refund.” Which they eventually did, many days later. The second time, same excuse but now had our team gravely concerned. To make matters worse, it was discovered that the property and liability insurance had not been paid. Needless to say, the relationship ended very poorly. We moved out at a huge expense. The fulfillment center went out of business so after. Even though we thankfully dodged a major disaster, this was a painful and expensive lesson. Does the company represent itself well? Do you have similar goals and a common business philosophy? Is this a team of people with integrity that you can trust impeccably? Is this a partner that is committed to your profitability and success or are you another opportunity for the owner to support a lavish lifestyle? Strike up a conversation on hobbies. Do they have expensive hobbies: Golf at Pebble Beach, mountain climbing the Himalayas, scuba diving off the Thailand, flying a helicopter, Yacht, own a collection of Ferrari’s, etc… you get the point. If you live near the prospect, casually ask what neighborhood they live in. Sorry to get overly “stalkerish”, find out their neighborhood and drive by or if you are not nearby look up on Google. This will let you know their lifestyle. Google the owner to discover any past felonies, convictions or other bad news. Check their Facebook page – see what they do in their personal time. Check other social media – Twitter, Snapchat, Instagram, and Pinterest. Look for Videos on YouTube. Check mutual connections on LinkedIn. Seek out mutual professional connections and casually start asking around for any character concerns. Take a physical tour of the company and facility – look for any warning signs. Casually speak with as many employees as possible to get a gauge on the owner/management and conditions of the company. Look for matching or mismatched priorities – expensive office furniture, overstaffed, excessive non-business essentials (foosball table, games, kegs, etc). Get a gauge on morale at the company. Does the owner wear an expensive wardrobe or jewelry? Last, ask the owner for an opportunity to have a mutual meeting with their accountant to view audited financials. Even offer to have the meeting at your expense. Going the extra mile with your due diligence process will save you a tremendous amount of grief and frustration down the road. For more info on electronics manufacturing, please connect on Facebook, Twitter, Google+, and LinkedIn. When considering outsourcing services to a custom manufacturer of any industry, asking challenging questions is critical for selecting the best fit possible. Having a list of tough questions prepared brings tremendous value to the process. Since we are a Wire Harness Manufacturer, we will specifically address Interviewing a Wire Harness Manufacturer. At this stage, you have narrowed the field down to either a single or hopefully a few candidates. Now is time to begin the interview process. 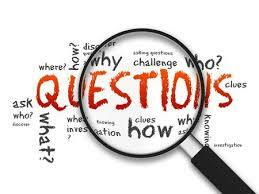 Asking tough interview questions will help lead you to the valued partner that you desire. This partnership will take your business to the next level. At least, that is the goal. For example, do you find the company accessible and responsive? To vastly increase our response time with customers, we recently launched the Falconer Electronics Wire Harness Estimator. This new tool allows customers the ability to gather an estimate immediately. Click here for more details. We are continuing our series on going through the entire due diligence process of selecting a custom manufacturer to outsource products. This week we suggest a list of questions to ask when Interviewing a Wire Harness Manufacturer. Being overly prepared and asking the right questions can save you a great deal of grief and frustration down the road. Hastily jumping into a new relationship with a custom manufacturer that turns sour can be devastating and difficult to recover depending on the severity. What industries do you serve? Please describe your ideal customer? Greatest victory in your business career or at your company? Biggest let down or setback and how did you resolve? Could you share exciting changes taking place at your business? What are you absolutely best at? Who are your key employees? Describe the experience of staff? Do I have access with the floor supervisor? Who is my main point of contact? Do I have a contact on weekends? Who do I contact for an emergency? Can you supply 3 customer references? Are you willing to sign a non-disclosure form? What is your lead time on orders? Are you able to tackle rush orders? Should the customer supply parts or do you prefer to supply parts? Do you have aggressive discount programs with vendors? Do you take advantage of early payment discounts with your vendors? Do accept credit card for payment? Are discounts available for early payment? Could we compare discounts with UPS/FedEx to see who has best rates? Who is responsible for damaged goods during shipping? Do you accept blanket orders? Will you inventory our raw parts or finished goods when necessary? Are you willing to purchase new tools or equipment to complete projects? Can we work with you on projections? What software do you use for inventory management and scheduling? Do one or two customers represent more than 50% of your annual sales? Have you ever been sued or in a lawsuit? Have you ever gone bankrupt? How do we handle damaged goods or parts not working? Can you describe your testing process and quality control? What is the company mission or vision statement? Is your company tech savvy? Do you have a succession plan or exit strategy in place? What makes your company stand above the competition? Facets of your business that demonstrate your commitment to your customer’s profitability? Any industry standards or certificates achieved? Do you have a safety protocol? What is your capacity level? Have you experienced layoffs recently? Please explain the reason a recent customer stopped buying from you? Asking excellent questions goes a long way with any relationship. This list is just a suggestive list of helpful questions to consider when Interviewing a Wire Harness Manufacturer. Thank you for reading this post. For more info on electronics manufacturing, please connect on Facebook, Twitter, Google+, and LinkedIn. Trying to Find a New Wire Harness Manufacturer? You have landed on the right place. As a Custom Wire Harness Manufacturer since 1985, our team at Falconer Electronics has worked with hundreds of customers ranging from many different industries. This blog post continues our series on maximizing the due diligence process when searching for a new custom manufacturer to outsource production. In particular, partnering with a New Wire Harness Manufacturer. Each week we are providing a helpful step by step process to provide guidance with your search. This week we discuss the process of discovering a New Wire Harness Manufacturer. How to Find a New Wire Harness Manufacturer? Partnering with to a New Wire Harness Manufacturer would be extremely beneficial for your company. Once you have decided to outsource your Wire Harness Assembly process, now the search begins. If you lack successful connections going this route, no fear. Call on your dear friend Google. Conducting a few Google searches will show you local and national Wire Harness Manufacturing companies. Is geography a critical factor? For example, if you were looking for a supplier of wooden pallets, you need somebody extremely close otherwise shipping costs would be brutal and cost prohibitive. With a Wire Harness Assembly, shipping costs are not prohibitive and detrimental. Partnering with the right company in another part of the country can still be an effective relationship. Once you have discovered a worthy prospect, begin conducting company research to see if this is a good fit for you. First, explore the company website. 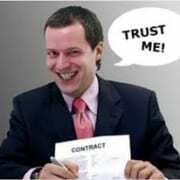 Does the website represent the company as a partner that you can trust? Does the company reveal itself having the staff, tools, resources, and ability to tackle your project? Do they serve your industry? Do they have the experience and expertise to take on your project? Proximity? Do they need to be within a certain distance of your facility? Is the company active on social media and communicating their culture? Does it fit with yours? Does the company provide helpful tips? Communicate the company mission? Does the mission fit with yours? Can you easily submit a drawing of your wire harness assembly? When you contact them, do you receive a quick response? Types of customers – What industry does the company target? Do they understand your needs? Can they speak your language? Do you feel a chemistry and kindred spirit with this company? Do they have the flexibility to speed up when during your busier times? Can they adjust to varying seasonal demands? Vendor relationships – Do they have outstanding vendor relationships? Do they have purchasing power? Are they willing to negotiate and fight for the lowest cost on product for you? Do they have strong cash flow and pay their bills on time so there are no delays in purchasing your product? Next week with our series on selecting a New Wire Harness Manufacturer to partner with, we will dig further into questions that you can ask during the interview process. For more info on electronics manufacturing, please connect on Facebook, Twitter, Google+, LinkedIn, and Pinterest. Determining the cost of a new Wire Harness Assembly just became a whole lot easier thanks to some hard work and innovation. 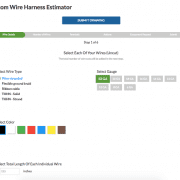 Falconer Electronics, Inc., (FEI) a wire harness manufacturer since 1985, proudly announces the new online FEI Wire Harness Estimator (https://falconerelectronics.com/custom-wire-harness-estimator/). 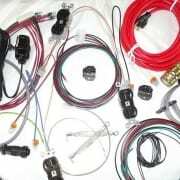 What is a Wire Harness Estimator? The brand new online FEI Wire Harness Estimator allows buyers, product designers, and engineers the ability to enter the specs of a wire harness assembly quickly and easily. This straightforward approach eliminates the need to wait days or weeks for pricing out your wire harness. The Wire Harness Estimator delivers an estimated cost of your wire harness assembly within seconds of submission directly to your email. Utilize the simplistic step by step process as you select each item required in your assembly. You can select your wire type, wire gauge, wire color, wire length, the number of individual wires, and wire terminals. Looking for additional connectors or other items not on the list? No problem! All you need to do is enter the manufacturer part number and the estimator adds that item to the estimate. Lastly, you can finalize your estimate with any add ons such as a spiral wrap, expandable sleeving, wire ties, and heat shrink. Wire labels and label flags can also be added. The only requirement is entering your name and email address. You will instantly receive an email with the estimate. No commitments – no obligation. The estimate does NOT represent a formal quote. This is an outstanding opportunity to provide a short cut for you to capture an estimate or a ball park price for your new wire harness assembly. For detailed pricing on quantity breaks or a formal quote, you are welcome to submit a drawing and a request for proposal. A team member from Falconer Electronics will contact you with an actual quote fitting your timeline and quantity needed. You can call 716-665-4176 or email [email protected] with any questions to walk through the process. No minimums required and we welcome customers of all sizes. Thank you so much for reading this post. We invite your constructive feedback on how the Wire Harness Estimator can help your business. We would love to hear from you. Please connect on Facebook, Twitter, Google+, and LinkedIn for more electronic info. Is it Time to Outsource Your Wire Harness Assembly Process? This a common question our new customers typically ask themselves before reaching out to us. Many times in life, if the question crosses your mind, then odds are it is time to act. For example, is it time to discard those old ratty sneakers that offend everyone around you? Most likely it is time to let go. Do you eat the leftover seafood from Monday night – on Saturday? Probably not a good idea. You question if you are too old or if it is still cool to wear your KC and the Sunshine Band t-shirt – Duran Duran – New Kids on the Block – or whatever generation you are from. Then it might be time to hang it up. Actually, that is a bad example. It is never time to grow up. Anyway….. 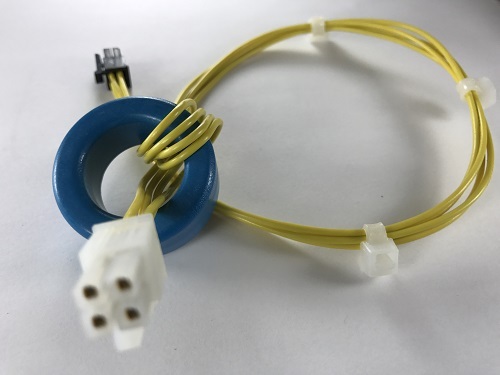 If you have been asking yourself if it is time to outsource your Wire Harness Assembly Process, odds are the time has arrived. At the very least, it certainly doesn’t hurt to investigate further. Start by identifying what event occurred or how this question arrived. Understanding when, how and why this became an internal burden is an important step. What hold ups, hang ups, pull downs, drag downs, hiccups, throw ups, headaches, heartaches, belly aches, or pain in the “you know what” has occurred. Think about the moment where you thought to yourself, “there must be a better way”. Start with a SWOT on your internal Wire Harness Assembly process. What are the company strengths, weaknesses, opportunities, and threats? Especially if you keep this process in-house. Do the same procedure and create a SWOT if you were to outsource your Wire Harness Assembly Process. The next question becomes, “Who can solve this problem so we can focus on our core business”? A key to building a successful business is partnering with experts in a given field. Successful companies exist by solving a problem. Solving a problem requires developing an area of expertise. A proficiency that stands above the competition. You need to partner with a company that thrives and works relentlessly to gain a competitive advantage. Also, one that creates economies of scale for you. Most importantly, a solution so tremendous that it just doesn’t make sense to perform these tasks on your own anymore. Can you change the oil in your car in less than 30 minutes? Is your time worth more than the price to have a quick stop oil change shop (Ex: JiffyLube) perform the task? As a business owner or manager, you hire professionals to strengthen your business and protect your assets. This list includes hiring an accountant, attorney, or insurance broker who have invested the time and energy to educate themselves on business law, tax codes or proper insurance policies. You rely heavily on these individuals to help you make critical business decisions. Surrounding yourself with highly trained and qualified professionals has the potential to pay huge dividends. Outsourcing certain tasks within the manufacturing process offer similar benefits. Teaming up with an all-star team creates a winning formula allowing you to maximize profits while minimizing risks. This post kicks off an eight part series on Outsourcing Your Wire Harness Assembly Process. We will weigh in on the due diligence and selection process as well as many other strategies and helpful tips. At Falconer Electronics, Wire Harness Manufacturing and Assembly runs through our veins. Having built literally millions upon millions of Wire Harnesses over the past 30 years, many of our employees say they could build a wire harness in their sleep. (Is that why they started bringing their pillows to work?) On a serious note, Wire Harness Testing is a core process with every order. Consistent and accurate Wire Harness Testing contributes greatly to our long-term and successful customer relationships. Safety First! Wire Harness Testing requires extreme caution since live wires are involved. Unfortunately, electric shock and burns can turn a great day into a real bad day quickly. Mandatory personal protective equipment on the job includes gloves and safety glasses when testing a wire assembly. When performing Wire Harness Testing, our quality control department strictly follows the IPC/WHMA-A-620 Standard. This standard is a collection of visual Quality Acceptability Requirements for Cable, Wire and Harness Assemblies. To learn more about the Wire Harness Manufacturing process, click on these links: Crimping Wires and Crimping Tools. Thank you for taking the time to read our blog post on Wire Harness Testing. To learn more about the wire harness assembly process, please continue reading our weekly “Wire Harness Wednesday” blog series. Also, click on the following links to learn more on printed circuit boards, soldering circuit boards and soldering safety tips. Lastly, let’s get social! Please connect on Facebook, Twitter, Google+, LinkedIn, and Pinterest for more electronic info. The list below includes a number of Wire Harness Terms and definitions. Many of our customers are new to outsourcing their wire harness assemblies. Hopefully, you will find these Wire Harness Terms helpful, particularly if this is all new to you. 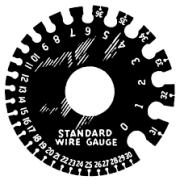 American Wire Gage (AWG) – A standard system for designating wire diameter. Primarily used in the U.S.
Bellmouth – The raised portion at the front and/or back of the wire barrel crimp that provides a gradual entrance and exit for the wire strands without causing damage. Braid – Woven bare metallic or tinned copper wire used as shielding for wires and cables and as ground wire for batteries or heavy industrial equipment. Also, a woven fibrous protective outer covering over a conductor or cable. Cable – A group of individually insulated conductors in twisted or parallel configuration under a common sheath. Cable Assembly – A cable with plugs or connectors attached. Coaxial Cable – A cable consisting of two cylindrical conductors with a common axis separated by a dielectric. Conductor – An uninsulated wire or the conductor of an insulated wire suitable for carrying electrical current. Conduit – A tube in which insulated wires and cables are passed. Connector – A device used to physically and electrically join two or more conductors. Contact – The conducting part of a connector that acts with another such part to complete or break a circuit. Crimp – Final configuration of a terminal barrel formed by the compression of terminal barrel and wire. Crimp Height – The measurement of the overall wire barrel height after crimping the terminal. Dielectric – Any insulating medium that intervenes between two conductors. Double Crimp – The process of two or more mechanical crimping operations on the same location in a single terminal. Ferrule – A short tube. 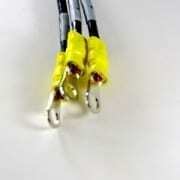 Used to make solderless connections to shielded or coaxial cable. Also, a terminal crimped onto stranded wire to allow insertion into terminal blocks. Grommet – A rubber seal used on the cable side of multiple contact connector to seal the connector against moisture, dirt or air. Harness – A group of wire and cables, usually made with breakouts, which are tied together or pulled into a rubber or plastic sheath. A harness provides interconnection of an electric circuit. Insulation – A material that offers high electrical resistance making it suitable for covering components, terminals, and wires to prevent the possible future contact of adjacent conductors resulting in a short circuit. 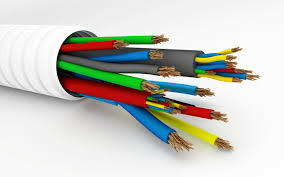 Insulation Crimp – Area of a terminal, splice or contact formed around the insulation of the wire. 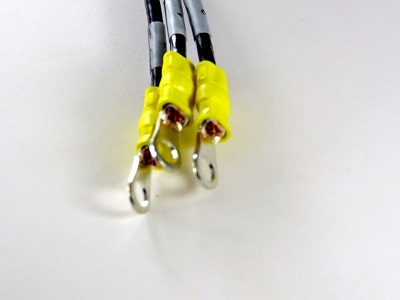 Lanyard – A device attached to certain connectors that permit uncoupling and separation of connector halves by a pull on a wire or cable. RF Connector – Connector used for connecting or terminating coaxial cable. Ribbon Cable – A flat cable of individually insulated conductors lying parallel and held together by means of adhesive film laminate. 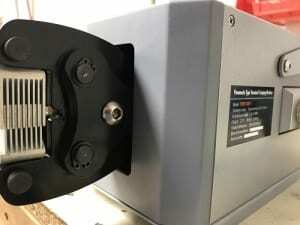 Strain Relief – A technique or item which reduces the transmission of mechanical stresses to the conductor termination. Stress Relief – A predetermined amount of slack to relieve tension in component or lead wires. Terminal – A device designed to terminate a conductor that is to be affixed to a post, stud, chassis, another conductor, etc., to establish an electrical connection. Some types of terminals include ring, tongue, spade, flag, hook, blade, quick-connect, offset and flanged. Tubing – A tube of extruded non-supported plastic or metallic material. Wire – Slender rod or filament of drawn metal. 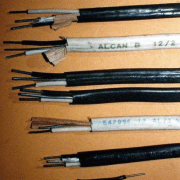 Wire Diameter – The overall conductor plus insulation thickness. Also, if you are a circuit board junkie, check out our blog series on soldering printed circuit boards. Wire Insulation really took off in the twentieth century when changing technology became easier. Natural rubber compounds were typically used to insulate wires starting the twentieth century. In the 1930s, PVC insulation was developed. This was used more often starting in the 1940s. PVC, Cresyl Phthalate, DEHP and other plastics replaced rubber as an insulator for wires and other parts starting in the 1950s. NMC or plastic-insulated wire or “Romex” has been in use in the U.S. since about 1926. Plastic NMC began replacing both rubber wire insulation and fabric-based wire insulation in the U.S. in the 1950’s. PVC here refers to plastics based on polyvinyl chloride. Plastic or thermoplastic nonmetallic cable still referred to by many electricians as “Romex” cable, has been in use since the 1960’s. In the U.S., Romex cable became widely used in new residential construction by 1970, completely replacing fabric-based wire insulation products. But in some large cities, electrical conduit was used rather than plastic NMC. The earliest form of the electrical wiring system in buildings in the U.S. was knob and tube. 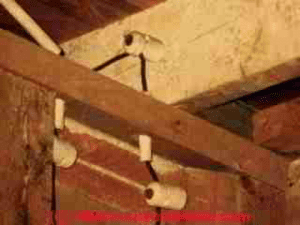 Knob-and-tube wiring is supported with ceramic knobs and runs intermittently through ceramic tubes beneath framing and at locations where the wires intersect. This type of insulation diminished in North America by 1940 but continued to be installed as new work in some locations until about 1975. They become less common because of many problems including, the insulation that envelopes the wiring was a fire hazard. It tends to stretch and sag over time and they lack a grounding conductor. 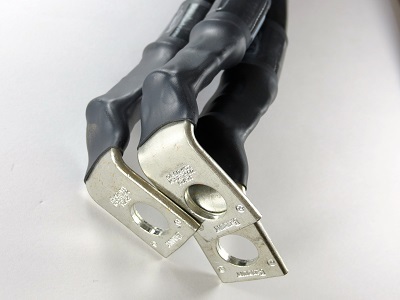 Grounding conductors reduce the chance of electrical fire and damage to sensitive equipment. The exterior insulation on fabric-insulated NMC electrical wires is often black, silver, or white. 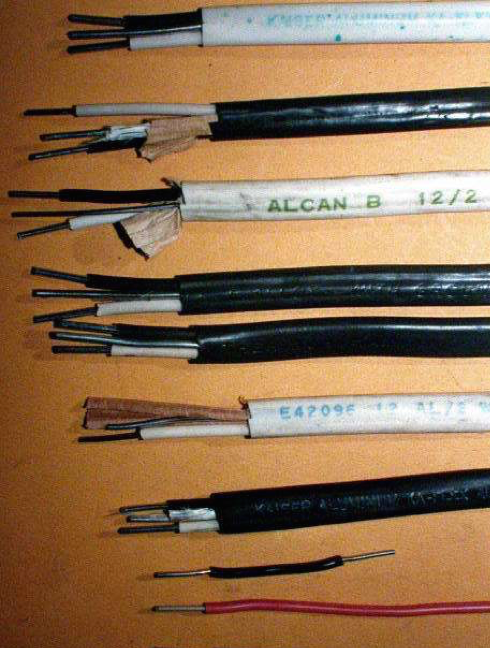 The individual wires within the cable may be insulated in rubber or fabric-covered rubber. They may be insulated by plastic in later wiring products. The conductors are themselves covered by a variety of materials: fabric over rubber, rubber, and plastic. 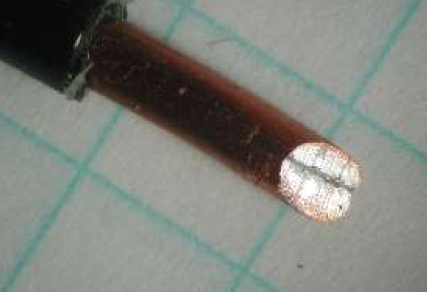 The photograph of copper-clad aluminum electrical wire shows the wiring sheathing markings. 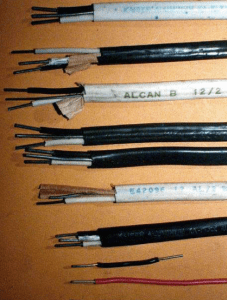 This NMC or non-metallic-sheathed cable electrical wire was observed in a 1974 Edina MN townhouse and was connected to an FPE electrical panel. 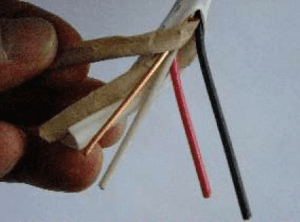 Unlike aluminum electrical wire used in branch circuits (a fire hazard), copper-clad aluminum wire performs about as well as copper wire and is considered safe for use in homes provided of course that the wiring has been correctly installed. 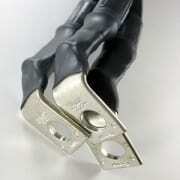 Typically, aluminum electrical branch circuit wiring was plastic-covered. Aluminum wiring has been studied since about 1945 and began appearing in homes in North American as early as 1965. In that year Kaiser Aluminum and Chemical Corporation began marketing KA-Flex solid-conductor aluminum wiring. Unless it has been properly repaired or replaced, aluminum wiring in homes or other buildings is a serious fire hazard. Thank you for taking the time to read our blog post on wire insulation. Also, check out our blog posts on soldering printed circuit boards. The history of wire insulation starts in the nineteenth century. Insulators are used in electrical equipment to support and separate electrical conductors. An insulating material used in bulk to wrap electrical cables or other equipment is called insulation. The first electrical systems to make use of insulators were telegraph lines. 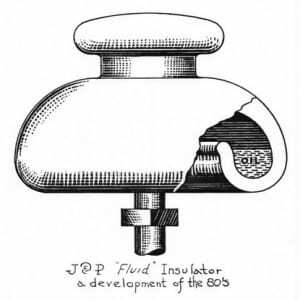 This took place in the 1840s where glass served the primary insulator at the time. 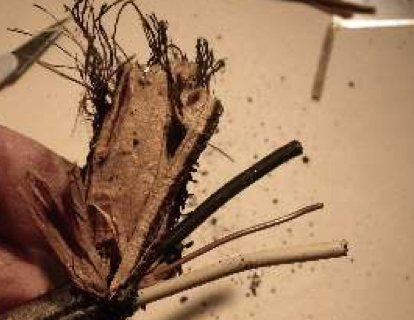 Also, plant products worked to wrap cables or hold wires. In 1844, Samuel F.B. Morse sent the first telegraph message. Consequently, he used a flat wood board beneath apparatus as an insulator to hold wires. The wire directly attached to a wooden pole delivered very poor results, especially during damp weather. In 1893, Westinghouse developed a transmission line for the famous Niagara Falls to the Buffalo transmission. This was made out of porcelain insulators rated at 11,000 volts which were used temporarily until insulator technology was developed that could handle 22,000 volts. Common types of Insulation for the Nineteenth Century. Glass act as a conductor when exposed to humidity. It attracts to its surface vapors of the atmosphere. They form there a thin film of water, by which the electricity passes through. 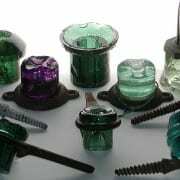 The types of insulators used for glass are glass unprotected by iron, glass protected by an iron covering, pine wood baked and soaked with shellac then having a piece of glass inserted. Also glazed porous earthenware, or baked clay, glass upon wooden pins, protected by a wooden shield, white flint, bone-rubber surrounding an iron hook, and the bone-rubber protected by an iron covering. The biggest objection to the use of the unprotected glass insulator is its great liability to fracture. 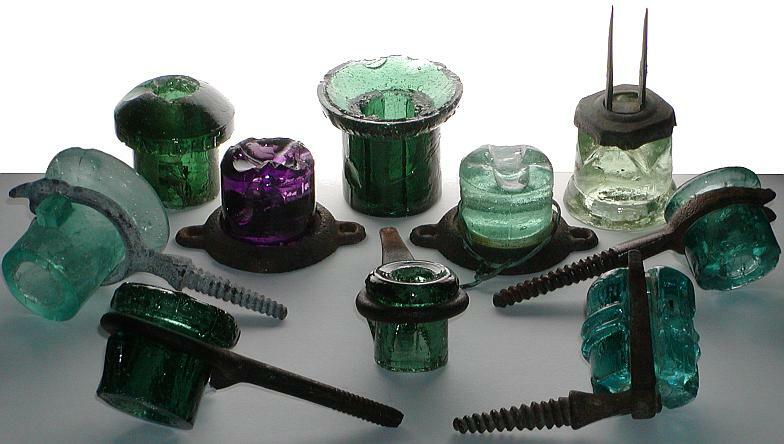 The first glass insulators used in large quantities had an unthreaded pinhole. These pieces of glass were positioned on a tapered wooden pin, vertically extending upwards from the pole’s cross arm. Natural contraction and expansion of the wires tied to these “threadless insulators” resulted in insulators unseating from their pins, requiring manual resetting. The manufacturers of the glass insulator find it extremely difficult to increase the strength of the material by increasing its thickness. Mainly due to the account of the difficulty experienced in suitable annealing it. As a result, a slight scratch often causes the thicker insulator to fracture and become useless. Porcelain insulators produced from clay, quartz or alumina and feldspar, and finally covered with a smooth glaze to shed water. Insulators made from porcelain rich in alumina are used where high mechanical strength is a criterion. Demand for master potters dramatically increased to create porcelain products due to the new electrical revolution of the 1880s. Simply changing to existing porcelain products was only a temporary solution, because the needs for even higher voltages came about in the 1890s. Chemists and material engineers helped design higher performance porcelain insulators with special coatings and designs. William Cermak, who came from Kasejovice, Czech, built a reputation for glass and porcelain pottery. He developed the now famous “petticoated” insulator design offering a succession of ridges. One of his pioneering designs handled over 10,000 volts for the first time in history. In the 1880s, Edison used Trinidad asphaltum with linseed oil, beeswax, and paraffin to insulate copper wires mounted inside of iron pipes. Mainly used for durable underground power lines and made famous at the Pearl Street Station in NYC. Insulating Oil (Transformer Oil) – This petroleum product served as an electrical insulator and thermal conductor. Especially since it conducts heat away from hot transformer coils. Some capacitors also use insulator oil. Wires can be found…..seems like….everywhere. Any electrical product that demands a current flowing will typically require a wire (or cable). Even when you hear something is “wireless”, wires power the device sending a signal. Electricity traveling through wires bring each of us tremendous joy and pleasure (computers, the internet, music, social media, communication, vehicles, transportation, appliances, etc..). Actually, can you imagine surviving a single day without electricity? Well, in the early stages, electricity did not travel so safely through wires. Thankfully electricity travels safe and sound through wires protected with wire insulation. The explosive growth of electrical products over a century ago drastically increased the use of wires carrying electricity. Unfortunately, uncovered or exposed wires caused extremely dangerous situations. Exposed wires led to electrical shocks or fire. However, a brilliant move was made to protect and strengthen wires by adding a non-conductive cover. Applying Wire Insulation to protect wires greatly reduced potential hazards and threats. Due to increasing demand, electrical products required an affordable and efficient solution to protect wires. Also with the early growth in popularity of wires, a wire harness assembly became necessary. It is much more efficient harnessing loose wires as opposed to allowing a free for all. Especially as electrical consumer goods and the auto industry exploded in the early 20th century. Insulation serves as a non-conductor that separates and protects wires within a harness assembly. Especially since it is a nasty world out there with many detrimental elements that can cause harm to naked wires. To save the day, an insulated jacket protects each wire from detrimental elements keeping the wire cozy and safe. Insulation protects the wire from water and moisture as well as extreme heat or cold. Thankfully wire insulation today is much more efficient, effective and affordable. For example, thermoplastic high heat-resistant nylon coated wire (THHN wire) is low cost, light weight, and an extremely popular wire insulation option. Lastly, let’s get social. Please check out our Facebook, Twitter, Google+, LinkedIn and Pinterest for more electronic info. The Wiring Harness UL Traceability Program allows manufacturers of finished goods to accept wiring harnesses manufactured off site or at a third party. Maintaining supply chain integrity while adhering to end user sourcing requirements is the key. 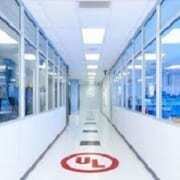 UL offers a traceability program that determines components consistency due to UL requirements for compliance. This program helps to bring safer products to market since it follows UL standards. It also ensures the confidence that outsourced products are meeting safety standards and requirements. Custom manufacturers are faced with many challenges. Being a part of the supply chain for an Original Equipment Manufacturer (OEM) comes with a significant responsibility. Especially with electrical products. Manufacturers in the supply chain have a social responsibility to produce high quality and safe products. In turn, the Wiring Harness UL Traceability Program provides the OEM with confidence while mitigating the risks associated with the introduction of non-compliant cable into their products. As a wire harness manufacturer for over 30 years, Falconer Electronics works closely with customers to ensure UL standards and requirements on electrical products and assemblies. 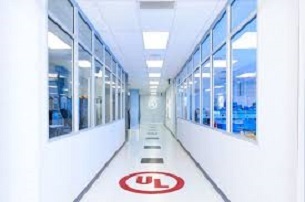 Having obtained numerous UL listings for electronic products, the team at Falconer Electronics fully understands the rigorous process and necessary requirements. We also provide the necessary support and guidance that you need to successfully build your products. UL requires minimal to no testing with obtaining certification and quick turnaround. Also UL clients have immediate use of standard labels. Let’s get social. Please follow us on Facebook, Twitter, Google+, and Pinterest for more electronic info. With over 30 years of wire harness assembly experience, Falconer Electronics has accumulated an impressive arsenal of crimping tools. When crimping wires and cables for our customers, utilizing the proper tools allows our team to execute jobs with accuracy and efficiency. Also in a safe manner. Wire harness safety is crucial. 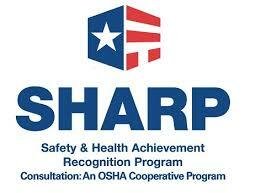 Even though we are commemorating May being National Electrical Safety Month, we focus on safety 12 months a year (check out our post on participating in the SHARP program). Using proper tools for crimping, measuring, inspecting and cutting wires are all key ingredients to our long term sustainability. Many projects require crimping wires by hand. 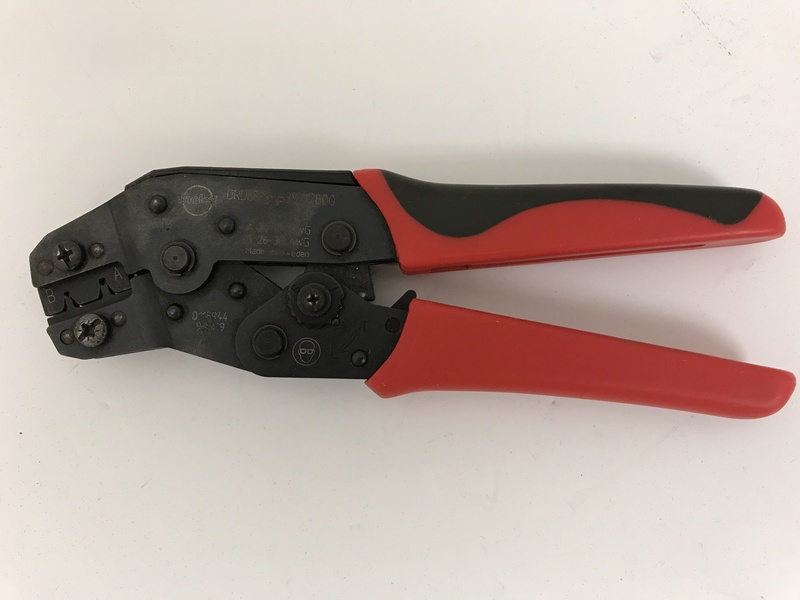 When producing wire assemblies for prototypes and small volume runs, handheld crimping tools sure come in…..handy. It is extremely important to look over the entire assembly when selecting the proper tool. 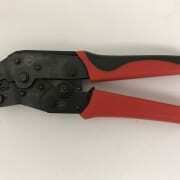 For example, a basic pliers-style crimp tool can fit various wires, connectors and terminals. Of course matching the right size tool is imperative when terminating wires. Not interested in crimping wires by hand? No problem. Pneumatic crimping tools are extremely beneficial and efficient. A pneumatic tool allows you to work hands-free being powered by air. Also these tools are fast, accurate and can drastically increase production. You can also find us on Twitter and Google+. Continue to check out our blogs throughout every week this month for more information on Wire Harness Manufacturing! Who Knew There Were So Many Different Ground Strap Names? Your drawing has been received. We will contact you soon.